. In order to see the wide diversity of images and sound available on the WWW in 2001, it is necessary to obtain particular plug-ins [also called Browser Extensions] because Netscape and Internet Explorer (the two most popular browsers) are not always installed in a way that allows you to see 95% of all the images, and hear all the audio, on pages you might visit. A plug-in, sometimes called a browser extension, enhances the ability of the browser to see and read content (images and text) on the displayed page, which your browser might not normally be able to see with the standard installation. Most plug-ins are developed by third party vendors who create plug-ins and make them available through various web sites. The text has a very good explanation of sound and sound files so you are STRONGLY encourage to read all of chapter 15. Understand that adding sound to your web site is a relatively new feature of sites since most people accessing the web have had speakers on their PCs less than 2 years. Furthermore, the use of sound is a bit complicated because Netscape and Microsoft have adopted different ways of playing sound that differ from each other. 1. sampling rate in samples per second "The sampling rate of a sound is the number of times that a sound is divided up, measured, and recorded. The smaller and more numerous the samples per second, the closer the digital sound comes to recreating the natural experience of sound." 2. number of bits used to record each sample "The bit rate determines how "fine" or "granular" the sound is being recorded. Typically, most sound formats are recorded at eaither 8 bits or 16 bits". Remember, more bits means more memory so a high sampling will require more storage space. 3. number of channels of sound "A single channel of sound is used for mono sound, and two channels is used for stereo". You may have these sounds on existing pages, or all on a single page - just as long as the teacher can find where you put it. MIDI was introduced in 1983. Midi files are some of the first kind of files people add to their page when they are first starting to experiment with adding sounds. They are easy to find, and do not require any fancy plug ins since most basic computers come with the necessary simple players to handle playing the file. The Real Player control box will pop up in the screen and allow you to adjust volume in the song, as well as replaying, or fast forward. If you do not have the Real Player plugin on your computer, you can get it. www.mp3.com With the popularity of downloading mp3's just before the court orders Napster to shut down [March 2001] many students will undoubtably be interested in knowing how to add .mp3 files to their site. If you have several .mp3 songs which you really like, you can put them all on one page and your friends can download them from your site - sort of like your own homemade "Napster"
Explorer One of the things people like to do is add music on to a page so that it loads when the person visits the page for the first time. 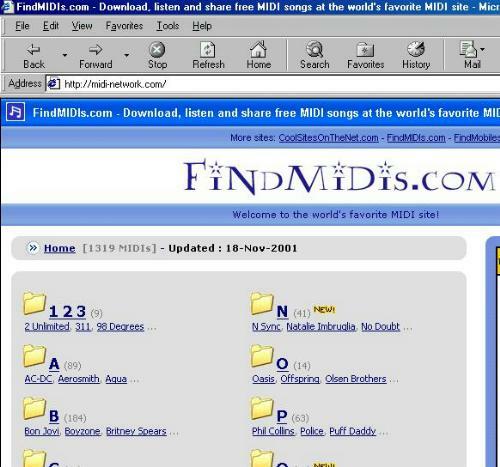 There are many examples of this on the Internet, one example is a page that lists many midis. CAUTION: when you place this tag on the page DO NOT put it at the top of the page since it will delay the page loading. Keith Schengili-Roberts says the best thing to do is put it at the bottom of the code on the page so the viewer can see the image and text load, without having to be delayed waiting for the sound. 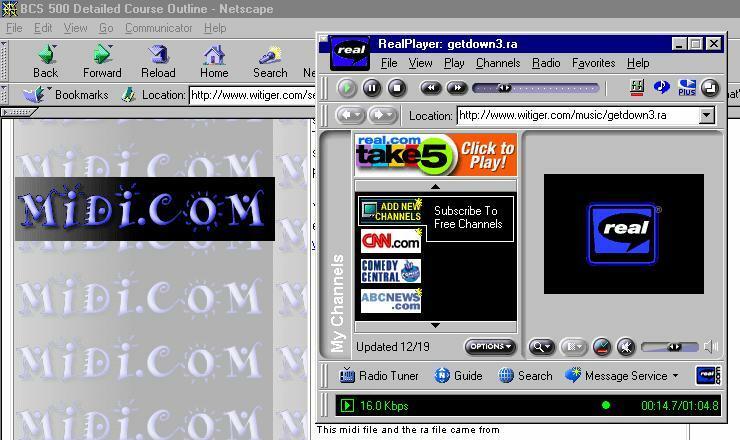 Netscape One of the things people like to do is add music on to a page so that it loads when the person visits the page for the first time.